St Peter the Poor Fisherman can be found nestled close to a cliff edge overlooking Stoke Bay. 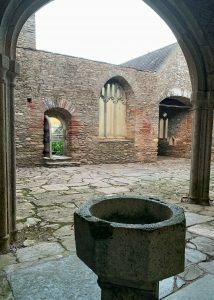 A romantic Medieval ruin situated about 1 1/2 miles from the quaint village of Noss Mayo, today the church can be found in the most unusual of places. 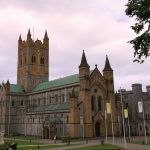 After all, though it stood isolated for centuries, today the ecclesiastical building can be found in among countless holiday homes! 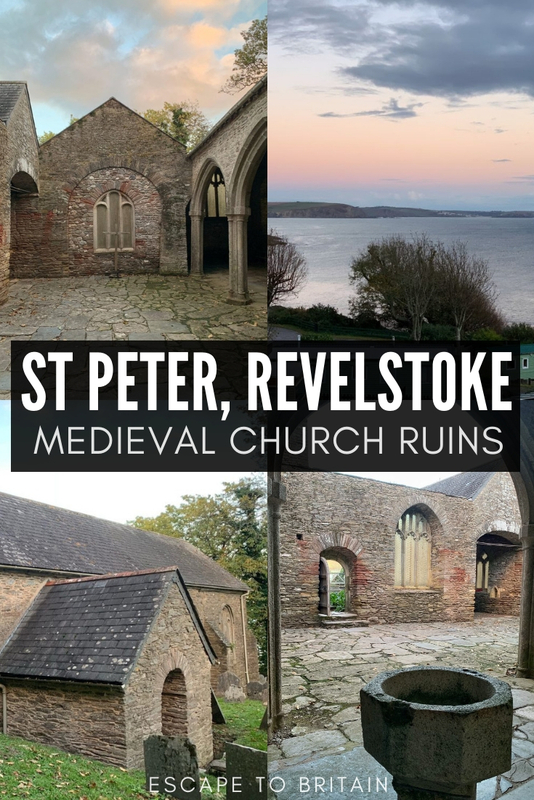 Drive along quintessential narrow winding Devon lanes for about a mile and a half beyond the picturesque estuary village of Noss Mayo and you’ll discover the 13th-century ruins of St. Peter the Poor Fisherman, Revelstoke. Follow the signs for STOKE beach. 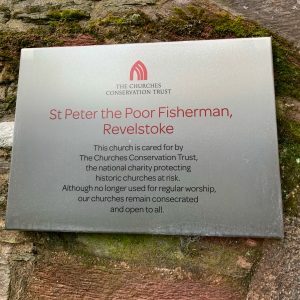 Alternatively, the Church of St Peter the Poor Fisherman, Revelstoke can be accessed by walking along the headland via the South West Coast Path. 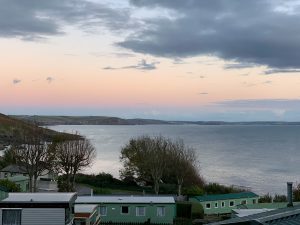 It’s now somewhat incongruously situated within the boundaries of a static seasonal holiday park that was founded during the 1920’s. Revelstoke was a civil parish within the Plympton St Mary District and included the village of Noss Mayo. 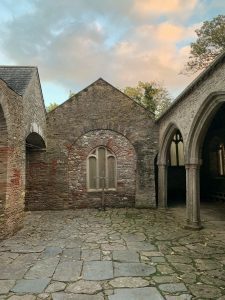 In fact, St. Peter’s was the principal church for the parishioners of Noss Mayo until a new building was constructed in the village itself, towards the end of the 19th century. 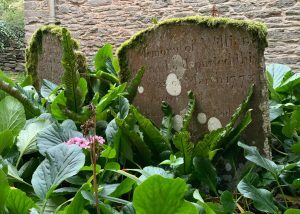 It must have been onerous indeed to trudge behind a hearse from Noss Mayo all the way to the church in appalling weather. 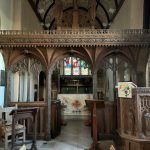 In 1935 the former parish was merged to create Newton and Noss which is now in the South Hams District. Nobody knows exactly why St Peter the Poor Fisherman was built in its present isolated situation, but, it’s believed that there has been a church on the site since at least the 11th century. This previous structure was perhaps an oratory for the Cathedral Church at Old Sarum (Salisbury, Wiltshire) which owned land in the area. 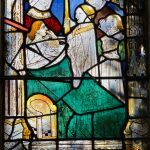 The first documentary mention of the church is in a charter dated 1225 by which time it had become a chapelry of the Church of St Bartholomew in Yealmpton. 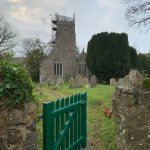 During the 1840’s the Revelstoke Church was badly damaged during a severe storm and over the years fell into further disrepair; by 1869 it was deemed unsafe for use. 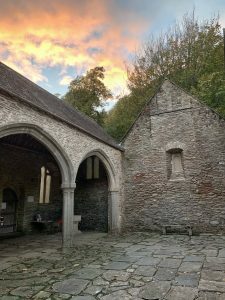 Towards the end of the 1870’s Edward Baring, (a senior partner at Barings Bank) purchased the, now defunct, Membland Estate which encompassed both Noss Mayo and the Stoke area including the parish church. 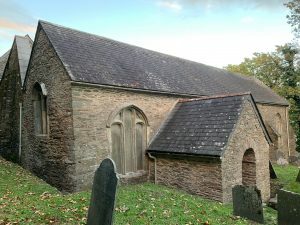 Rather than attempting to repair the existing parish church, he made the decision to construct a new church within Noss Mayo itself; this was consecrated in 1882. In the 1960’s a group of locals decided to try and preserve the dilapidated remains of St. Peter the Poor. 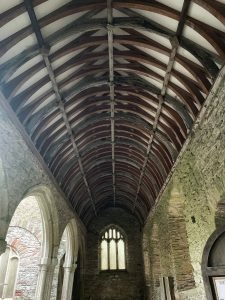 By 1972 it was handed over to The Churches Conservation Trust and major repairs were carried out on the fabric of the building and the attractive results can be seen today. The church remains consecrated and open-air services take place biannually along with baptisms and wedding blessings. NOSS MAYO – The picture-perfect village is just over a mile away and well worth a visit. 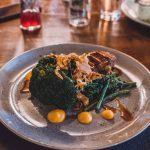 Enjoy a pub meal at the waterside Ship Inn and then wander up the hill to visit the new St. Peter’s Church built for the villagers by Edward Baring. REVELSTOKE DRIVE – Enjoy the breathtaking views from Lord Revelstoke’s carriage drive and imagine what it must have been like to ride in a carriage so close to the cliff edge! A great place to start the walk is at Stoke Point Car Park. SALTRAM HOUSE – An enormous Georgian property owned by the National Trust set in attractive grounds. 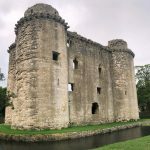 Today, members of the National Trust can visit for free, while everyone else can pay a fee to see the house and its gardens. 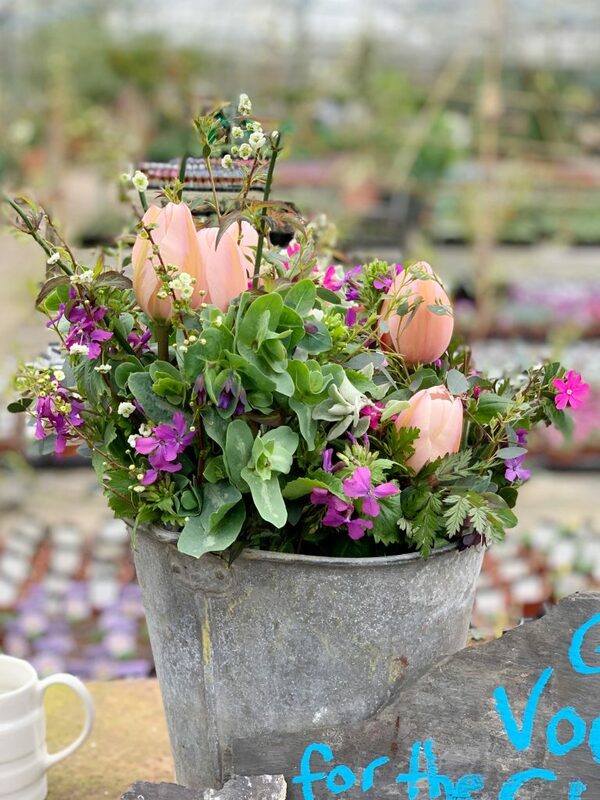 Should you have time, be sure to stop for a coffee and cream tea in the Chapel Tearooms, it’s well worth a wander inside!